Jackson Pollock (American, 1912–1956) opted for an early exit from high school in California to study with Thomas Hart Benton at the Art Students League of New York. After gleaning what appealed to him from the Regionalists, Mexican muralists, and Surrealists, Pollock worked for the Federal Art Project from 1938 to 1942. 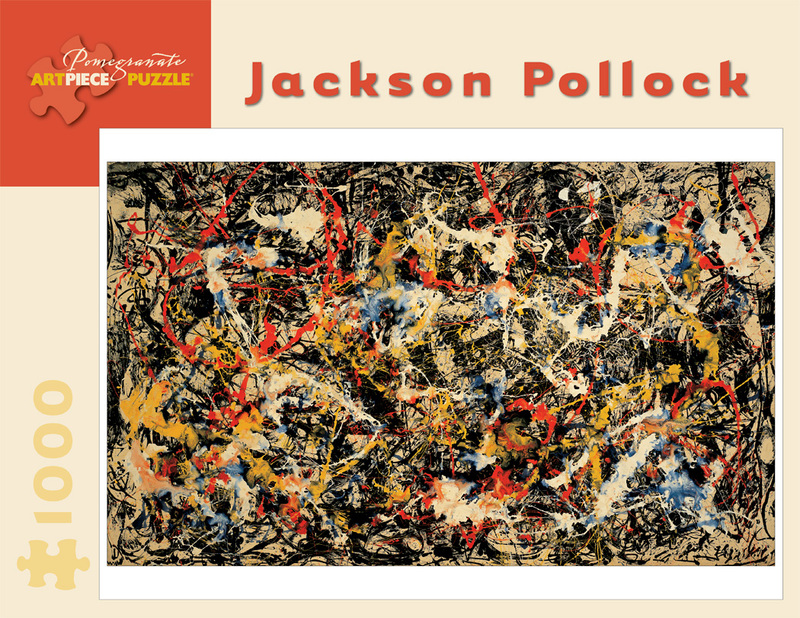 By the mid–1940s Pollock was painting in a wholly abstract manner, and in 1947 he arrived at the drip and splash style with which he is most often associated. Affixing canvases to a wall, the floor, or the ground if painting outdoors, Pollock dripped and poured commercial house paint from cans and arranged it using “sticks, trowels, or knives,” sometimes augmenting it with sand, broken glass, or “foreign matter,” as Pollock stated it. He placed great import on being able to walk around such paintings and work on them from all four sides. Such “action painting,” opined artists and critics, expressed or revealed the unconscious moods of the artist. Pollock’s drip paintings, as Willem de Kooning said, “broke the ice” for the Abstract Expressionists who followed Pollock. In 1964, Springbok Editions issued Convergence as a 340-piece jigsaw that was touted as “the world’s most difficult puzzle.” With this 1,000-piece reemergence of Convergence, Pomegranate just about triples the challenge. Best of luck to all aspiring solvers! Thoughtfully conceived and engagingly intricate, our 1,000-piece jigsaw puzzles combine superb color reproduction, stunning and unusual images, and sturdy construction to delight generations of novice and veteran puzzleworkers.